Good geographers know that maps can lie to you. Every map emphasizes some aspects of a place at the expense of others, giving it a lot of power to lead careless readers astray. Maps of Scotland's recent independence referendum are misleading us about the reality, even if not intentionally. By now you've probably heard the results of Scotland's independence referendum: voters chose "no" by a solid margin of 55% to 45%. Check out our previous article to learn more about what would have happened if Scotland had voted "yes". Maps like this one from the BBC and this one from Wikipedia have popped up since the results came out, showing how each of Scotland's council areas voted. Most of the country is in red for "no", with a few "yes" areas in green. But if one area went 51% for "yes", and another 51% for "no", those two areas actually voted almost identically - yet contrasting red/green maps make us feel like they're polar opposites (not to mention that one-in-thirty readers has trouble seeing the difference between red and green). Whether each area's people voted just over or just under 50% in favor isn't actually that important. What matters is how far the balance was tipped in each region. This is not the U.S. presidential election, where the final vote is actually made by delegates obligated to go by the majority in each state. All the votes across Scotland were pooled together to determine the result, so which side of the 50-yard line each area came out on has no effect . In reality, the vote was split in every part of Scotland. No council area voted more than 58% in favor of independence or more than 68% against. The above map is designed to show how close the vote really was all across the country. 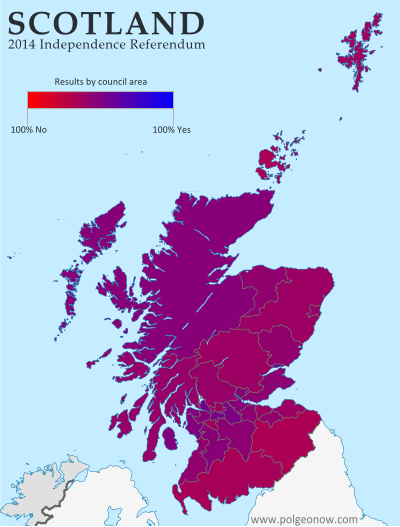 Since no area came close to voting completely for independence (blue) or completely against it (red), on this map Scotland's council areas all end up colored in purplish hues. 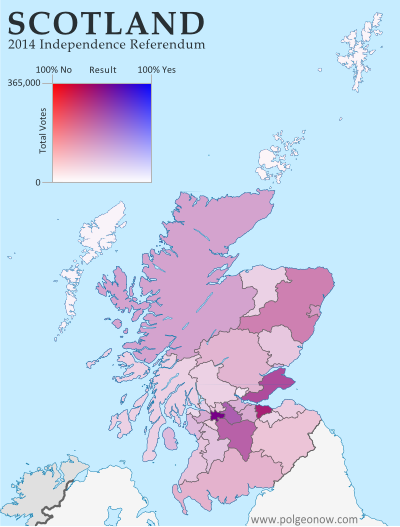 The Glasgow metropolitan area, the main region where independence bagged more than half the vote, appears as a slightly bluish purple lump in the bottom-center, while border areas that voted "no" by a larger margin turn out purplish-red (as does Orkney, the group of islands just north of the Scottish mainland). Most of the remaining councils voted more narrowly against independence, showing up in intermediate hues. In fact, the above map still hides an important factor in the results: the council areas didn't each have the same number of votes. While turnout was high across the country (75-91%), population varies drastically from council to council. Glasgow city cast nearly 356,000 ballots, while rural Orkney had a mere 14,887. The second map (at left) tries to show the relative importance of each area in deciding the countrywide result. Here, the same range of purple hues are made lighter or darker depending on how many total valid ballots were cast in each council area. It's a bit more complicated to read, but the message is clear. The outer islands' voting populations are so small that they look white to the naked eye, with each group contributing only about five percent as many votes as the biggest city. Meanwhile, Scotland's two major cities of Glasgow (left, bluish) and Edinburgh (right, reddish) stand out sharply with their huge numerical advantage. The country's number three city, Aberdeen, seems to have its votes divided between the surrounding Aberdeenshire (large, medium-shaded chunk at upper-right) and the city proper (lighter-shaded kernel along the coast). Meanwhile, the Scottish Highlands, the huge region at upper-left, are sparsely populated but carry some collective clout due to sheer size. Maps that contrast colors on either side of the 50% mark may be a simple and attention-catching way to show election results, but they mislead us by making countries look more geographically-divided than they really are.